Probably the easiest and cheapest way to filter your drinking water is through the use of a water filter pitcher. To use you just simply fill up the reservoir and wait for the water to be filtered into the pitcher. You can simply store it in the fridge so you have cold, clean water for your to use whenever you need. So what makes up the best water filter pitcher? You should look for one that is the most effective at removing contaminants or that remove specific contaminants that you do not want to consume. Most contain a carbon filter, but some offer multiple stages of filtration or just plain work better than others. This should result in clean, good tasting H2O. You also should be aware of how long the filters last and how much replacement filters cost. Over the life of the pitcher you will spend much more on the filters than the initial cost of the unit. One of the common complaints for this type of filtration system is that it can take between 10 and 30 minutes for gravity to pull the water from the upper reservoir through the filter and into the storage tank. So make sure you always fill it up when you pour some liquid out. Below we review the top 5 best water filter pitchers. At the bottom of these water pitcher filter reviews we also have a comparison chart so you can easily check one versus another. We selected the $70 Aquagear Water Filter Pitcher as the best water filter pitcher. While it is a bit more expensive than other similar pitchers, the high-quality 5-stage made in the USA filter will last for 150 gallons of water. You can buy a replacement filter for $50. The Aquagear filter was tested in Flint, Michigan for lead and copper reduction. In fact it meets and exceeds NSF Stadards 42 and 53 for contaminant reduction. This filter removes between 90 and 99.9% of most contaminants including flouride, lead, chromium 6, mercury, arsenic, chlorine, and over 50 VOCs more. It does all that, yet does not strip out healthy trace minerals like calcium and magnesium in your water. Unfortunately, there is no indicator to tell you when the filter needs to be replaced. The Aquagear Water Filter Pitcher is also backed up by a lifetime guarantee – they will replace your filter pitcher if it ever breaks. Overall it is a bit more expensive than some other brands per gallon of water filtered, but the filter can last a long time while being superior to most others in filtering capability. If you are searching for a water filter pitcher to remove flouride then this is the one for you. 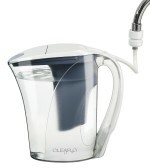 Another quality model is the Brita 36395 Monterey Water Filter Pitcher which sells for $40. 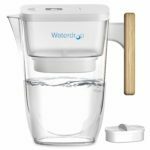 It uses the Brita Longlast Filter, which is much better than the standard Brita filter used on pitchers like the Brita 10-Cup Everyday Water Filter Pitcher. The Brita Longlast Filter is the cheapest filter that removes lead in terms of price per gallon of water filtered at just $0.12 per gallon. A replacement filter will cost around $14 and will last for 120 gallons of water or about 6 months. This filter is certified by wqa to reduce 99% of lead, chlorine, cadmium, mercury, benzene, asbestos, and more. A helpful status indicator on the pitcher notifies you wneh the filter needs to be replaced. 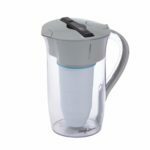 The Brita 36395 Monterey Water Filter Pitcher is a perfect choice for anyone who wants a good filter with a cheap overall cost for its life. The $32 Clear2o CWS100 received the highest score from the leading consumer magazine. This 72 ounce, or 9 cup, BPA-free pitcher has been independently tested on over 200 contaminants to surpass NSF/ANSI 42 and 53 and NSF/ANSI 401 test standards for removal of herbicides, pesticides, pharmaceuticals, industrial wastes, and PFOA’s. The filter is good for 50 gallons of water, while an indicator will change colors to let you know when it is time to replace the filter. The replacement filter is CWF503 and costs about $10 each or $30 for a 3-pack. The biggest problem with the Clear2o model is the way it is filled at the faucet. It requires an adapter that fits on standard faucets, but it does not work with newer style kitchen sprayer-type faucets. A quick-connect hose is then connected and is used to actually fill the pitcher, however it is also very short and does not work for many people. We recommend the Clear2o CWX100B Quick Connect Hose Extender to make it more convenient to fill up. The advantage of this system, however, is that it takes much less time to filter since it uses water pressure to force it through the filter. One of the best water filter pitchers strictly based on the ability to filter is the $22 ZeroWater ZR-0810G 8 Cup Round Pitcher. ZeroWater’s claim to fame is a 5 stage filter that removes 99.6% of total dissolved solids (TDS). In fact it includes a TDS meter with the pitcher to test your water before filtering and after. You can also use the TDS meter as an indicator of when it is time to change your filter – once the TDS are not reducing in the filtered water, it is time to change. One slight problem with the filter is that it can actually strip healthy trace minerals like calcium and magnesium out of your water. The biggest downside to the ZeroWater is that the replacement filters are the most expensive per gallon of water filtered. The ZR-006 replacement filter only lasts for 15 gallons and costs about $10 each or $40 for a 4-pack. 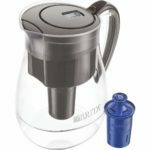 Over the life of your pitcher it will cost you a significantly more than any other water filtering pitcher on this list. You should consider buying the ZeroWater ZR-0810G 8 Cup Round Pitcher if you simply want the best ability to filter regardless of price. If you want cheap water filtering then the $28 Waterdrop Extream 10-Cup Water Filter Pitcher is for you. The WD-PF-01A replacment filter costs $30 for a 3-pack which is $10 each while lasting for up to 200 gallons of water. This makes it the cheapest price per gallon of water filtered at just $.05 per gallon. This filter uses Japanese activated carbon to remove impurities, however, this filter does not remove lead. The Waterdrop Extream is made from BPA-free shatter-proof Tritan. It has a fast 0.5 GPM flow rate which means you get 10 cups of clean water in just one minute. It also has an electronic filter reminder when the filter needs replaced. If you know your water supply does not contain lead or other heavy metals, then the Waterdrop Extream 10-Cup Water Filter Pitcher is a great choice for you due to its cheap lifetime cost.